Chris Padgett has long been a person I have looked up to as a father of 9, a strong Catholic, and a fellow musician to name just a few. This was my first chance to read one of his books. Being 129 pages, this book is not meant to encapsulate everything Mary. But this book does a good job of hitting on many topics such as the Immaculate Conception, Marian apparitions, the Mother of God, the assumption, her virginity, and even protestant oppositions. This would be a great book for people who are not familiar with many of these topics or people who don't see the need to honor Mary. If you are a big Mary "fan", then you won't find many ground breaking things here, but you will come away with something, which is what learning about our faith is about, right? I loved the focus near the end of the book about family prayer and rosary. The need to be an example to our family and our children and to help create a foundation of prayer is much needed. Many times practical application is what is missing in books such as this, but Padgett brings it back home on this one. This review was written as part of the Catholic book reviewer program from The Catholic Company. 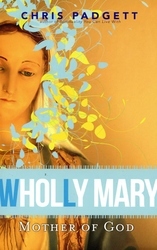 Visit The Catholic Company to find more information on Wholly Mary - Mother of God. They are also a great source for a Catechism of the Catholic Church or a Catholic Bible.